Today, KaBOOM! announced Landscape Structures as its next “Partner in Play,” with a three-year partnership set to begin on January 1, 2019. 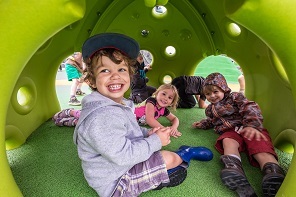 The Partner in Play serves as the primary supplier of playground equipment and partner in building hundreds of playspaces in communities in need across the United States, Canada and Mexico. 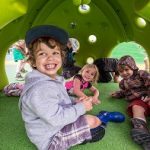 Landscape Structures, an employee-owned company that designs and manufactures playground equipment based in Delano, MN, has designed, manufactured and installed more than 80,000 playgrounds worldwide. A leader of the industry, Landscape Structures has focused on designing and producing innovative playground equipment that ensures kids of all abilities can play side by side. About Landscape Structures Since 1971, Landscape Structures Inc. has been the leading manufacturer of commercial playground equipment in the world. Our employee-owned company designs community and school playgrounds that encourage kids of all ages and abilities to learn persistence, leadership, competition, bravery, support and empathy through play. We push the limits—of design, inclusion, play—to help kids realize there is no limit to what they can do today and in the future. For a better tomorrow, we play today.